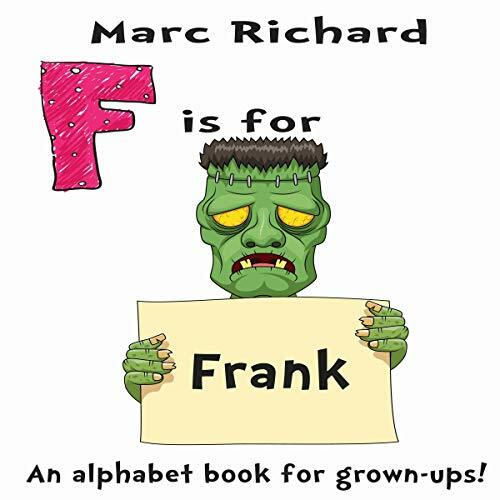 F Is for Frank: An Alphabet Book for Grown-Ups! But when meat becomes scarce, a new item appears on the menu: Franks Wurst. It's not long before that’s all anyone eats. E is for Eyeball: An Alphabet Book for Grown-Ups! A strange and humorous story that is downright silly at times. This story gives listeners a different take on Frankenstein. If you wonder about hot dogs now just wait until you listen to this book. This story will give you a chuckle or two as you are taken alongside the main characters and her adventures in finding out the truth about her world. This is a fast-paced listen that will take you into the world of the outrageous. Narrator David S. Dear brings this world to life and keeps the narrative flowing to keep the listener engaged with the story. I laughed so hard!!! I so do enjoy these silly, don't search for the hidden meaning of life, entertaining as all heck books and this one is right at the top! If only it was so easy to just switch careers and everyone goes along with it lol!! I think i will be a doctor... that sounds like fun, boom, charging hundreds of dollars for me to just listen to what they are saying and tell them they need to lose weight... bam! I'm a millionaire, maybe lol :) Definitely worth a listen/read!! Like with the rest of this series, it is absolutely funny and absurd (in a good way). The narration is good and I really enjoyed the listen. In short, this is a very humerously weird take on Mary Shelly's Frankenstein. If you like stories that turn the originals on their heads, you should check this one out. This is my first experience with this series so I didn't know what to expect. Turns out: Idiocracy. That's the best way to explain the way characters in this story act. It gets a chuckle early on, but after a while, the whole "I'm not taking myself seriously, look at my calling out my own silliness" gets a bit old. Add to that, the plot revolved around a mystery that was fairly obvious about halfway in, and that there's no real resolution to any of it, and I can't say that I felt it was a worthwhile listen. Perhaps that's the way these stories typically go and I just wasn't tuned for it. Either way, this wasn't really for me. The narrator did a pretty decent job (I was initially worried as his intro and outro contained a LOT of hard T's, which can get annoying, but the actual story was read without them). I requested this audiobook for free and this review is my own.